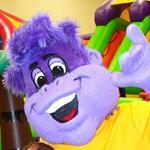 Monkey Joe’s Parties and Play franchise business opportunity. Free Monkey Joe’s Parties and Play business franchise information. The success of the Monkey Joe’s concept is built on Raving Brand’s time-tested tactics used in other such hot franchise concepts such as Moe’s Southwest Grill and Planet Smoothie. With unbeatable support, tools and assistance let the expertise that Raving Brands provides catapult you to the top of the industry. Our purpose at Monkey Joe’s is to encourage a healthy lifestyle through fun exercise in a safe, indoor play center for kids aged 2 -12. While kids learn the value of exercise and getting along with others, they can enjoy wild, inflatable slides and jumps and party rooms for all occasions. Parents can enjoy widescreen TVs and wireless high-speed Internet access in the comfortable parent area while the kids play their way to a healthy lifestyle. Monkey Joe’s is the destination that provides an active alternative to TV or video games, a way for kids to burn off that extra energy or a fun outing for the whole family. Not only do kids love Monkey Joe’s because of the exciting jumps and thrilling slides, but parents love our commitment to the highest safety standards. Raving Brands has a family of flourishing concepts, the tools and the know-how to help our franchisees every step of the way. We make it easy to swing into this fun, innovative and successful franchise with full support in real estate, marketing, sales, vendor relations and operations. Get in on the ground floor of this emerging concept, and take advantage of Raving Brands’ proven plan for success. Raving Brands launched such other hot concepts as Moe’s Southwest Grill, Mama Fu’s, Doc Green’s, Boneheads and Planet Smoothie. Financing: we will use our relationships with financial institutions to assist you in obtaining financing. To learn more about the Monkey Joe’s children’s franchise opportunity, simply complete the form below.